Infamous dog shock collars, or e-collars, are the most controversial training tool in the dog world. On one side there are the people who say shock collars are cruel torture devices, and on the other are those who have been using them safely and effectively for years. With so much hate and misunderstanding around the use of the shock/e-collars, how do owners justify using them? The most common misconception about the shock collar is that they are extremely painful and can cause serious medical problems. That's true, which is what we have previously established in several articles on the site. Training collars can be painful and cause medical conditions like burns and cardiac fibrillation as well as mental issues in dogs. However, after reviewing most of the cases, majority of experts agree that these devices are only dangerous when you use them incorrectly or when dog owners use shock collars to purposefully cause pain to dogs as a form of punishment. To avoid this, the key is to understand the instrument, get the right brand and an learn how to use it safely and correctly. Are there better ways to train a dog without the use of shock collars? Absolutely – there's plenty. But we all know that some dog owners will resort to these devices anyway. If you're one of those people, then remember how important it is to focus on the correct use. Always read the directions. A dog shock collar should never be used to intentionally cause harm to a dog. They should never be used on young dogs or senior dogs. You should never use the collar for more than a few hours a week, and only for training purposes, minimizing its use as much as possible. Always make sure your dog knows why he is getting the correction. If he is confused as to what the bad behavior was that he was corrected on, he will not learn. It will also cause his stress level to increase which does not result in a healthy, happy dog. To start, follow all directions to a letter. Read and learn about the use of these devices extensively before trying them. There's a lot of information available online, and many dog trainers provide their own advice on the matter as well. You have to find the dog’s “working level”, or the level on the remote that your dog feels and responds to. Once you're ready to begin, make sure your shock collar works as expected. It must be a quality brand that is extremely precise, with many different levels. Start on the lowest setting and work your way up slowly only if needed. Stop when your dog responds to the stimulation. His ears will prick and he will turn his head. Very often, using it once may be just enough. RELATED ARTICLE: Dog Shock Collars Controversy – What Do the Experts Say? Now that you know your dog's working level, you can start training on that setting. 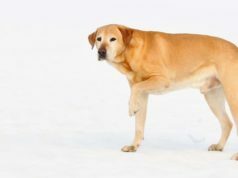 Gradually work your way down the levels until the dog refrains from doing the bad behavior with no stimulation required. Owners must use the right setting for each individual dog to make sure the shock collar training is not fear inducing. If the dog is afraid, the training will not work. This can create more behavioral problems, and is abusive to the animal. The name “shock collar” paints the picture of a device that electrocutes the dog to cause him pain, which stops him from doing an unwanted behavior. The collar does not electrocute, it sends electrodes into the muscle to make them contract. It is similar to the electrical stimulation treatments humans get to ease joint and muscle pain. The amount of stimulation the animal feels depends on the voltage of the electrical current, how long the current is sent and at which frequency. The amount of stimulation your dog will feel also depends on his physical characteristics like breed, coat and size. The technology behind the shock collar has improved tremendously in the past decade. Devices have gotten safer and easier for dog owners to use. Dog shock collars are particularly effective for dogs who do not respond to vocal or sound commands. However, for dogs that will respond to other stimulus, many devices have sound, vibration or spray settings. This can be a good alternative for people who are freaked out by the “shock” concept. These collars are also pretty affordable. They can be anywhere from $25 to $250. A very popular and safe collar on the market today is the Einstein E Collar. Is a shock collar the right training tool for you and your dog? An electronic collar is especially effective for dogs who don’t respond to other training methods, such as if they are stubborn or aggressive. They are effective in stopping barking, pulling on a lead and teaching dogs to stay away from dangerous animals (like rattlesnakes). Using a shock collar is a great way to safely train off-leash recall by diminishing the risk that your dog could be hit by a car. Training with a shock collar is fast – dogs tend to respond very well and quickly to corrections. If you have a shock collar for a dog who barks (also known as a no-bark collar) because of separation anxiety, you do not have to be home to train him. This is great if your neighbors complain. A huge positive for these products is that the dogs do not associate the stimulation with human influence. This means that you do not lose the connection with your companion by correcting his bad behaviors. Most dog e-collars have safety devices implemented to stop the correction after a few seconds. There are several misconceptions and drawbacks for these products that can actually be avoided when using them correctly. Critics of the shock collar say that it is not a humane training tool because it only utilizes negative reinforcement. People hear negative reinforcement and they immediately think ‘inhumane'. However, tugging back on a lead and poking or slapping a dog's muzzle are all forms of negative reinforcement. You can/should add positive reinforcement to the shock collar training. This could simply be a “good boy” or a treat when he responds to the collar. Critics also say that shock collar training provokes aggression. Yes, it can provoke aggression but again, only if you do not use it correctly. Dogs can become aggressive if they are scared. You do not want to put them in a situation where they are fearful and then act out in anger. If you train on a safe level, your dog will not be fearful or aggressive. Training dog collars, shock or e-collars are not for everyone, but they are one of the ways to quickly fix problems that other techniques may not work for. When used correctly they can be a safe, affordable way to use negative reinforcement to stop dangerous behaviors. Shock collars may get a bad rap for the misconception that they are dangerous. However, they are safe when used responsibly and correctly, and when only the right brand of training collars are used.